Elegant Engagements Wedding and Event Planners: An announcement! I don't always talk about personal things but I am bursting at the seams to tell the world. I am expecting a baby!! DH and I are going to have a lil pumpkin around Halloween! We had our ultrasound today and everything is perfect - what an amazing experience. 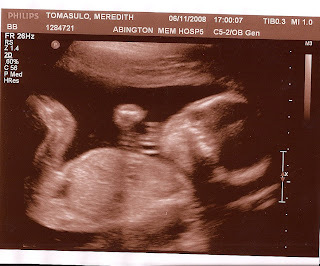 Baby was skirming around so this is the best profile shot we got! So you might be seeing some posts on baby showers and baby parties sometime this summer. I am also still taking clients for 2009 - no worries there! Congratulations to you and your DH Meredith!! WOW Meredith! Congratulations to you and Hubby! I'm so very excited for you and your new little family. I hope everything else is going great for you too! You know I'm soo happy and excited for you and hubby! Congratulations! Baby T is adorable already! Congrats again!